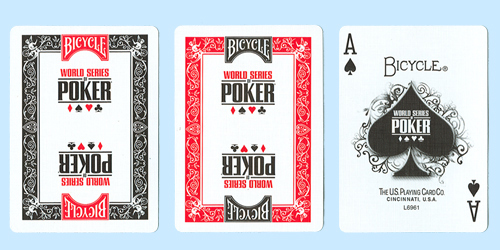 These unique Bicycle Poker Playing Cards are produced on Bicycle Stock and are officially licensed by the World Series of Poker. You can choose from single red and single black Bicycle World Series of Poker Tournament Decks and two-deck sets featuring one red and one black deck packaged in a double-deck tuck box. For additional information or volume pricing on Bicycle World Series of Poker Playing Cards, please contact us at 1-800-233-0828.